In order to facilitate selection of appropriate core samples by researchers, a summary of DSDP/ODP/IODP cores stored in the Kochi Core Center (KCC) is being prepared. A partially completed list, including summary of all DSDP cores being curated at the KCC, has been uploaded in the KCC website (www.kochi-core.jp/cs/). Researchers can use various combinations of keywords to find core samples of their research interest. Detailed information about each core can be downloaded through the links provided in the core summary. 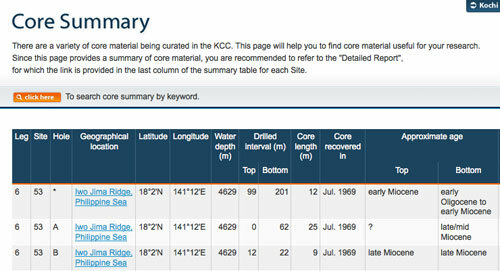 A pdf file listing key features of the cores from each DSDP Site has also been uploaded in the KCC website. Similar core summary for the ODP and IODP cores is being prepared, and will be uploaded in this website from time to time.